Morpheus Trading: Agriculture ETFs are heating up, led by an explosive move in Coffee (NYSEARCA:JO), while Cocoa (NYSEARCA:NIB) is at new 52-week highs after several weeks of basing action (though it doesn’t trade much volume). 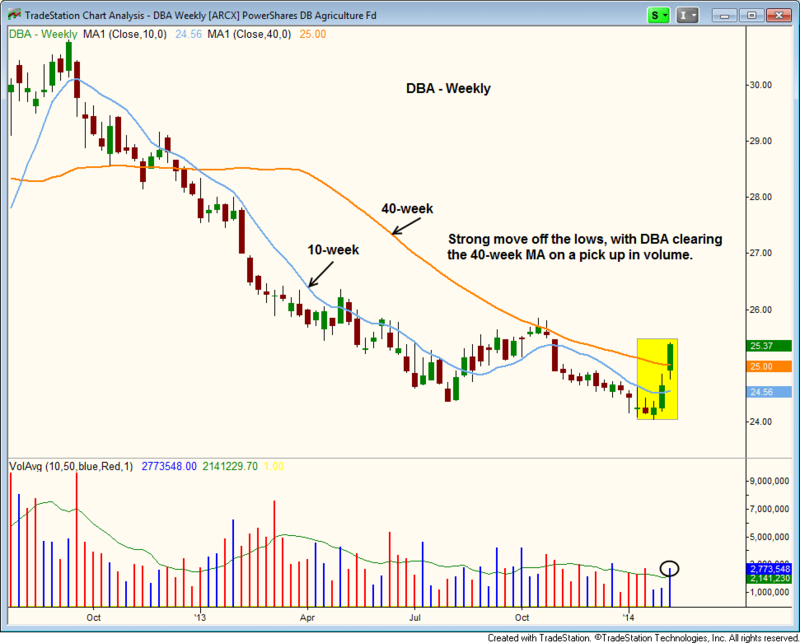 Presently, $DBA is too far extended for a low-risk entry point, but we will continue to monitor the action as we wait for a 4-5 base to form above the 40-week moving average. We’d also like to see the 10-week moving average climb above the 40-week moving average, and for the 40-week moving average to turn up. As with our current position in US Natural Gas Fund (NYSEARCA:UNG), one great benefit of $DBA is its lack of correlation to the main stock market indexes (because it is a commodity ETF). In weaker markets, ETFs really shine because of the ability to look for steady trends outside of the stock market trend. Again, its much too early to enter $DBA, but it is certainly one to watch. 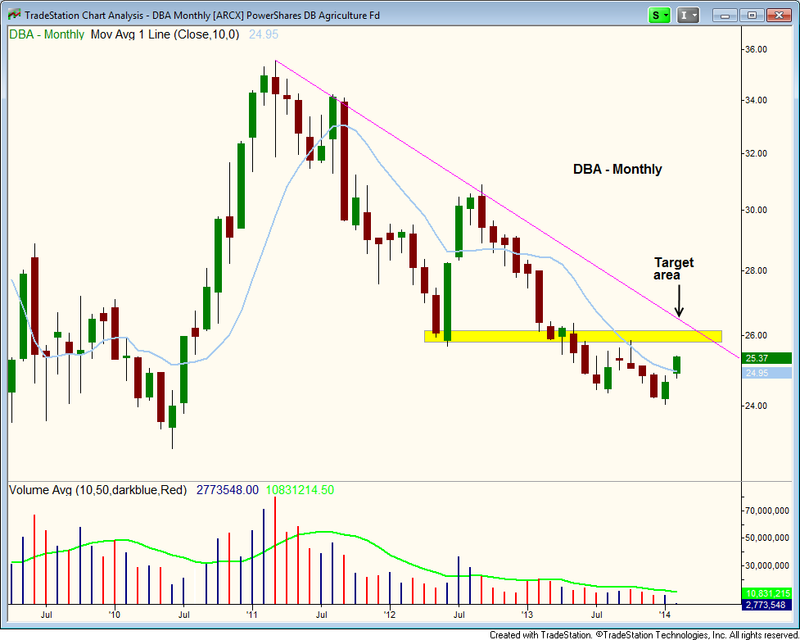 As always, we will be promptly alerted of our exact entry, stop, and target prices if/when $DBA meets our entry criteria. 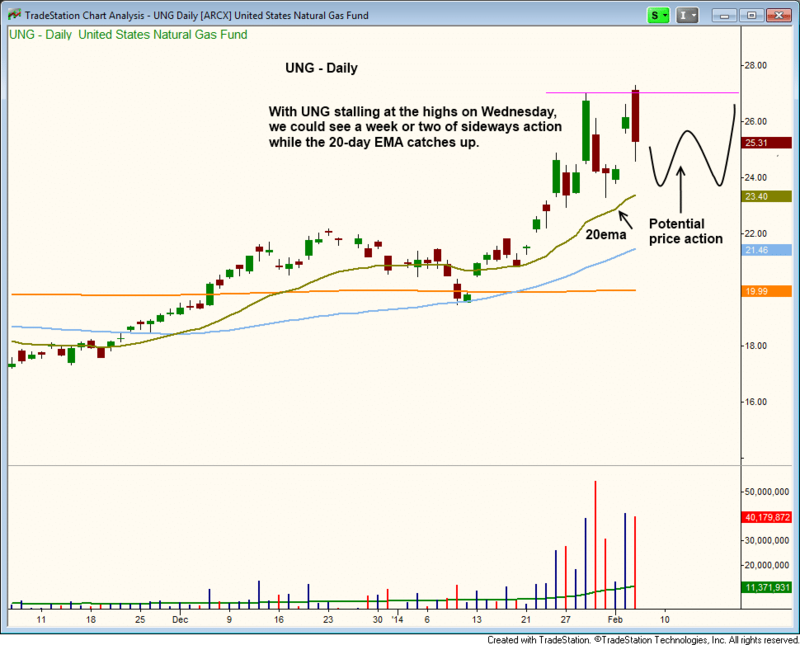 Presently, $UNG is showing an unrealized gain of 6.7% since our January 30 entry, and we will continue monitoring the price action for a potential entry point to add to the existing position. This article is brought to you courtesy of Morpheus Trading, LLC.